It's back to school time already! The holidays have just flown by. We're over Christmas, had our fun in the sun (with appropriate protection, of course) and shopped for new shoes, hats, uniforms and books. We've covered text books, labelled new clothes and lunchboxes, marked pencils and textas and we're all ready to start the new school year. And now it is time to get the kids back to school. By now they are probably busting to catch up with their friends to swap Christmas holiday stories. 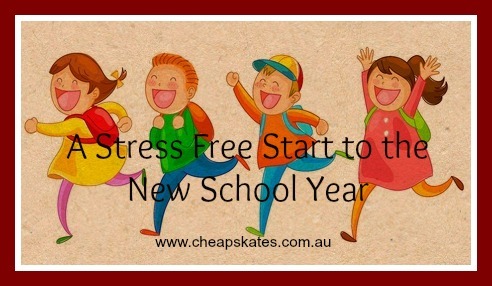 To help the school year start smoothly and stress free, I have some simple steps to ease back into school routines. They are the routines I used when my own children were at school and they worked beautifully (most of the time - we are a normal family after all). • Create a 'launchpad' where schoolbags, hats, sports equipment etc. is kept. Then it's just a matter of pick it up and go in the mornings. • Pack lunches and drinks the night before and refrigerate/freeze! • Make sure backpacks are packed and ready to go the night before. Lay out clothes the night before. • Remember kids need to make as many decisions as possible. Avoid power struggles by letting them make small decisions. • Create a special hamper in the laundry for uniforms and other rush items. • Fold T-shirts so that the design is recognizable without unfolding. Each evening before the kids go to bed, have a 10 minute family tidy-up time to get everything back in place.